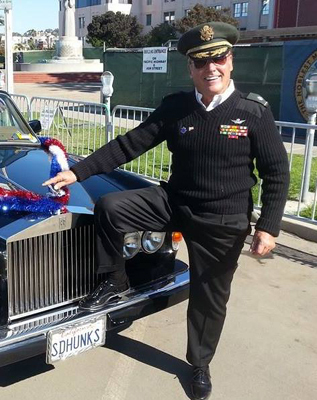 Brooke Eldridge is the owner of San Diego Hauling Hunks and a retired US Army Lt Col. who flew over 750 Combat Hours in Vietnam, flying the Cobra Helicopter! He was awarded Numerous Air Medals including the Air Medal For Valor, The Bronze Star, and Numerous other Combat Medals! Affectionately referred to as "The Colonel", Brooke has been a proud resident of San Diego for more than 25 years and considers himself a native? The Hunks are a Bonded and Licensed Hauling Company. We Carry $2,000,000 in Insurance and will add a second insured, as necessary or required to our insurance policy, if requested? Additionally, a copy of our insurance is available, upon request! San Diego Hauling Hunks has been in the Hauling, Moving and Demolition Business since 2006! We cover all of San Diego County, South, from Otay Mesa to Fallbrook in the North , and East to Campo and West to the Ocean! We are Proud Members of The San Diego BBB, with an A+ Rating! Our rates are very competitive, with Senior Citizen, Government, Public Servants, Teachers, Fireman, Policemen, and Military Discounts of 5% - 10%! There are usually Two Men on all trucks! We have Pickups, along with Box and Stake Bed Trucks! On our demolition side, we have several affiliates that provide us Dump Trucks, Bob Cats and Excavators. Normally, we schedule your pickup for the next day, or possible the last pickup of the same day, when the request is received by noon?